It’s no secret that Guillermo del Toro has a slightly deranged imagination, as witnessed by the twisted fantasy worlds and creatures from “Pan’s Labyrinth” and the “Hellboy” films, but there’s a beauty to his madness that flows through all of the director’s movies, perhaps none more so than his latest project. A gothic romance that’s equal parts Edgar Allen Poe and Emily Brontë, “Crimson Peak” feels like a nostalgic throwback to the kind of films that Hammer made in its prime. 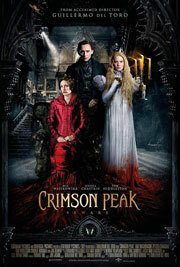 Though the movie’s supernatural elements aren’t as prominent as the marketing campaign would lead you to believe, “Crimson Peak” is a sumptuously designed genre flick that delivers a different kind of horror from the typical ghosts-and-ghouls haunted house story. Set during the turn of the 20th century, the film stars Mia Wasikowska as young American heiress Edith Cushing, an aspiring author who has no interest in romance, whether in real life or her stories, despite the fact that childhood friend-turned-physician Alan McMichael (Charlie Hunnam) clearly fancies her. When English baronet Thomas Sharpe (Tom Hiddleston) arrives in town seeking financing for a clay-mining machine that will help return his family’s business to its former glory, he’s turned away by Edith’s father (Jim Beaver), a self-made industrialist who sees right through Thomas’ façade. That doesn’t stop Edith from falling in love with the penniless aristocrat, however, and after her father is tragically murdered (although it’s covered up to look like an accident), Thomas whisks her away to England to live with him and his ice-cold sister, Lady Lucille Sharpe (Jessica Chastain), in their ancestral home of Allerdale Hall, a crumbling mansion that’s literally sinking into the ground due to the red clay mines below it. But when Edith begins to encounter tortured apparitions that haunt her new home, she uncovers terrible secrets about the Sharpe family history that threaten Thomas and Lucille’s ulterior motives. Charlie Hunnam, Rinko Kikuchi, Idris Elba, Charlie Day, Burn Gorman, Max Martini, Rob Kazinksky, Clifton Collins Jr.
It’s been five years since Guillermo del Toro’s last film, and between the problems he faced working on the “Hobbit” movies and trying to get passion project “In the Mountains of Madness” off the ground,” you could hardly blame the guy if he had just called it quits. But instead of getting frustrated by the Hollywood system, he gave them exactly what they wanted: an action-packed blockbuster that also appealed to his inner 12-year-old. “Pacific Rim” is about as close to a Transformers/Godzilla mash-up as you’ll ever see, so it’s not surprising how quickly fanboys jumped on the bandwagon. Unfortunately, the film lacks the uniqueness of the director’s other projects, because while it may not be based on a preexisting property like a lot of summer fare, it still feels oddly generic. That being said, you definitely won’t be bored, and that’s to the credit of the rich mythology that del Toro has created. Set in the not-too-distant future, giant beasts (referred to as kaiju) have emerged from an inter-dimensional rift below the Pacific Ocean to wreak havoc on every major coastal city from San Francisco to Tokyo. In response, the world’s governments came together to build giant robots called jaegers to combat these monsters, with two pilots controlling each machine via a neurological sync known as drifting. The more compatible the pilots, the better they perform. Though successful for several years, the jaeger program has become increasingly less effective as the kaiju continue to adapt and evolve. 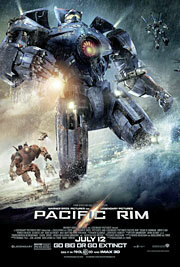 When the program is ordered to be shut down, commanding officer Marshall Pentecost (Idris Elba) recruits a retired jaeger pilot named Raleigh (Charlie Hunnam) to team up with rookie Mako Mori (Rinko Kikuchi), with whom he shares a particularly strong connection, and spearhead one final attack in the fight for humanity’s survival.